Richard Florida’s new book, Who’s Your City? First there was the best-selling Rise of the Creative Class that introduced the creative class and the creative economy in the U.S., followed by Flight of the Creative Class which took a global perspective. 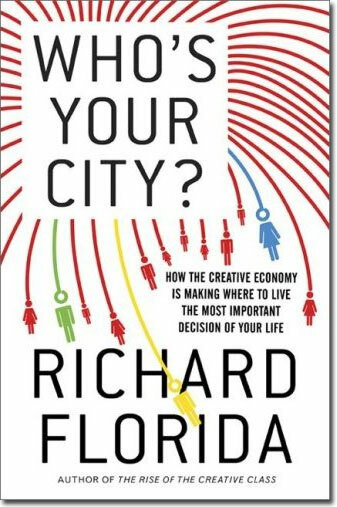 On March 10, 2008, economist and author Richard Florida presents Who’s Your City?, which is best explained by its tagline, How the Creative Economy Is Making Where to Live the Most Important Decision of Your Life. Part I. Why Place Matters – explains why place is best described in terms of mega-regions, of which there are 40 in the world. Part II. The Wealth of Places describes why the creative class is a primary reason these 40 mega-regions are the economic and cultural engines of the world. Part III. The Geography of Happiness – looks beyond jobs and identifies the primary factors (aesthetics, openness) and personalities cities possess that are much better predictors of attracting the creative class. Part IV. Where We Live Now – identifies the three big moves we make in our lifetime – post graduation/career development; when we have kids; and when they leave/we retire. Finally, Rich provides a final chapter with tools to help you find your ideal city. You can start with the place finder on the Who’s Your City? website, which is a fundamental complement to the book. You can listen to Rich via this Smart City Radio interview.